France (Paris); Middle 13th Century. Latin Text; Minuscule Angular Gothic Script. These miniature or portable manuscript copies of the Jerome version of the Bible were nearly all written by the young wandering friars of the newly founded order of Dominicans. With almost superhuman skill and patience, and without the aid of eyeglasses, an amazing number of these small Bibles were produced by writing with quills on uterine vellum or rabbit skins. Many such Bibles were produced for students at the early medieval universities and were made in such large quantities that today they are easy to find. The precision and beauty of the text letters and initials executed in so small a scale, twelve lines to an inch, with letters less than one-sixteenth of an inch high, are among the wonders in book history. The script is significantly faded in several places. The vellum is very white, thin, and soft, with vertical lead lines and horizontal dry-point lines. The ink is brown, red, and blue. Blue and red ink are used for decoration of the name of the book, for the initials at the beginning of each chapter, and for the Roman numeral chapter heads. The initials are complete with long flourishes. 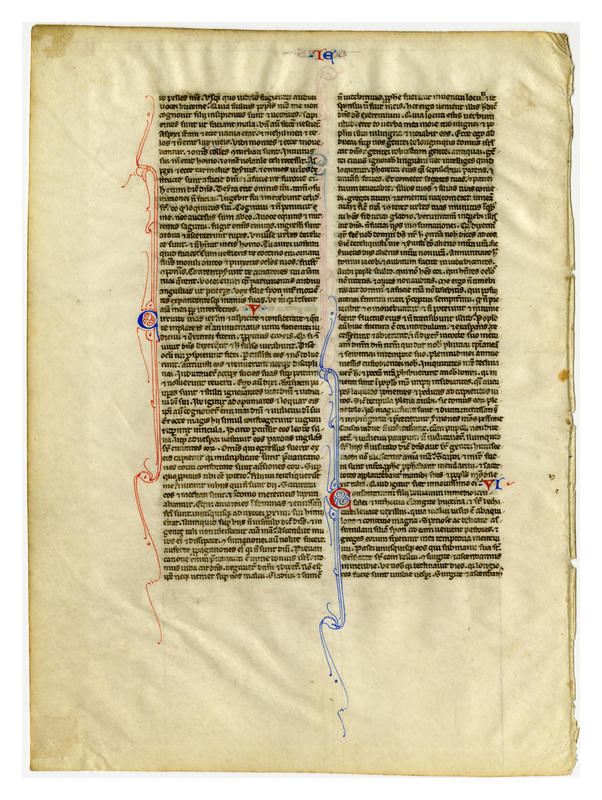 Text: Jeremiah 3:3-4:20 (recto) and 4:20-6:5 (verso). 3 Therefore the showers were withholden, and there was no lateward rain: thou hadst a harlot's forehead, thou wouldst not blush. 4 Therefore at least at this time call to me: Thou art my father, the guide of my virginity: 5 Wilt thou be angry for ever, or wilt thou continue until the end? Behold, thou hast spoken, and hast done evil things, and hast been able. 6 And the Lord said to me in the days of king Josias: Hast thou seen what rebellious Israel hast done? she hath gone out of herself upon every high mountain, and under every green tree, and hath played the harlot there. 7 And when she had done all these things, I said: Return to me, and she did not return. And her treacherous sister Juda saw, 8 That because the rebellious Israel had played the harlot, I had put her away, and had given her a bill of divorce: yet her treacherous sister Juda was not afraid, but went and played the harlot also herself. 9 And by the facility of her fornication she defiled the land, and played the harlot with stones and with stocks. 10 And after all this, her treacherous sister Juda hath not returned to me with her whole heart, but with falsehood, saith the Lord. 11 And the Lord said to me: The rebellious Israel hath justified her soul, in comparison of the treacherous Juda. 12 Go, and proclaim these words toward the north, and thou shalt say: Return, O rebellious Israel, saith the Lord, and I will not turn away my face from you: for I am holy, saith the Lord, and I will not be angry for ever. 13 But yet acknowledge thy iniquity, that thou hast transgressed against the Lord thy God: and thou hast scattered thy ways to strangers under every green tree, and hast not heard my voice, saith the Lord. 14 Return, O ye revolting children, saith the Lord: for I am your husband: and I will take you, one of a city, and two of a kindred, and will bring you into Sion. 15 And I will give you pastors according to my own heart, and they shall feed you with knowledge and doctrine. 16 And when you shall be multiplied, and increase in the land in those days, saith the Lord, they shall say no more: The ark of the covenant of the Lord: neither shall it come upon the heart, neither shall they remember it, neither shall it be visited, neither shall that be done any more. 17 At that time Jerusalem shall be called the throne of the Lord: and all the nations shall be gathered together to it, in the name of the Lord to Jerusalem, and they shall not walk after the perversity of their most wicked heart. 18 In those days the house of Juda shall go to the house of Israel, and they shall come together out of the land of the north to the land which I gave to your fathers. 19 But I said: How shall I put thee among the children, and give thee a lovely land, the goodly inheritance of the armies of the Gentiles? And I said: Thou shalt call me father and shalt cease to walk after me. 20 But as a woman that despiseth her lover, so hath the house of Israel despised me, saith the Lord. 21 A voice was heard in the highways, weeping and howling of the children of Israel: because they have made their way wicked, they have forgotten the Lord their God. 22 Return, you rebellious children, and I will heal your rebellions. Behold we come to thee: for thou art the Lord our God. 23 In very deed the hills were liars, and the multitude of the mountains: truly in the Lord our God is the salvation of Israel. 24 Confusion hath devoured the labor of our fathers from our youth, their flocks and their herds, their sons and their daughters. 25 We shall sleep in our confusion, and our shame shall cover us, because we have sinned against the Lord our God, we and our fathers from our youth even to this day, and we have not hearkened to the voice of the Lord our God. ...and my pavilions in a moment. 21 How long shall I see men fleeing away, how long shall I hear the sound of the trumpet? 22 For my foolish people have not known me: they are foolish and senseless children: they are wise to do evil, but to do good they have no knowledge. 23 I beheld the earth, and lo it was void, and nothing: and the heavens, and there was no light in them. 24 I looked upon the mountains, and behold they trembled: and all the hills were troubled. 25 I beheld, and lo there was no man: and all the birds of the air were gone. 26 I looked, and behold Carmel was a wilderness: and all its cities were destroyed at the presence of the Lord, and at the presence of the wrath of his indignation. 27 For thus saith the Lord: All the land shall be desolate, but yet I will not utterly destroy. 28 The earth shall mourn, and the heavens shall lament from above: because I have spoken, I have purposed, and I have not repented, neither am I turned away from it. 29 At the voice of the horsemen, and the archers, all the city is fled away; they have entered into thickets and have climbed up the rocks: all the cities are forsaken, and there dwelleth not a man in them. 30 But when thou art spoiled what wilt thou do? though thou deckest thee with ornaments of gold, and paintest thy eyes with stibic stone, thou shalt dress thyself out in vain: thy lovers have despised thee, they will seek thy life. 31 For I have heard the voice as of a woman in travail, anguishes as of a woman in labor of a child. The voice of the daughter of Sion, dying away, spreading her hands: Woe is me, for my soul hath fainted because of them that are slain. 1 Go about through the streets of Jerusalem, and see, and consider, and seek in the broad places thereof, if you can find a man that executeth judgement, and seeketh faith: and I will be merciful unto it. 2 And though they say: The Lord liveth; this also they will swear falsely. 3 O Lord, thy eyes are upon truth: thou hast struck them, and they have not grieved: thou hast bruised them, and they have refused to receive correction: they have made their faces harder than the rock, and they have refused to return. 4 But I said: Perhaps these are poor and foolish, that know not the way of the Lord, the judgement of their God. 5 I will go therefore to the great men, and I will speak to them: for they known the way of the Lord, the judgement of their God: and behold these have together broken the yoke more, and have burst the bonds. 6 Wherefore a lion out of the wood hath slain them, a wolf in the evening, hath spoiled them, a leopard watcheth for their cities: every one that shall go out thence shall be taken, because their transgressions are multiplied, their rebellions are strengthened. 7 How can I be merciful to thee? thy children have forsaken me, and swear by them that are not gods: I fed them to the full, and they committed adultery, and rioted in the harlot's house. 8 They are become as amorous horses and stallions, every one neighed after his neighbor's wife. 9 Shall I not visit for these things, sayeth the Lord? and shall not my soul take revenge on such a nation? 10 Scale down the walls thereof, and throw them down, but do not utterly destroy: take away the branches thereof, because they are not the Lord's. 11 For the house of Israel, and the house of Juda have greatly transgressed against me, saith the Lord. 12 They have denied the Lord, and said, It is not he: and the evil shall not come upon us: we shall not see the sword and famine. 13 The prophets have spoken in the wind, and there was no word of God in them: these things therefore shall befall them. 14 Thus saith the Lord the God of hosts: Because you have spoken this word, behold I will make my words in thy mouth as fire, and this people as wood, and it shall devour them. 15 Behold I will bring upon you a nation from afar, O house of Israel, saith the Lord: a strong nation, an ancient nation, a nation whose language thou shalt not know, nor understand what they say. 16 Their quiver is as an open sepulchre, they are all valiant. 17 And they shall eat up thy corn, and thy bread: they shall devour thy sons, and thy daughters: they shall eat up thy flocks, and thy herds: they shall eat thy vineyards, and thy figs: and with the sword they shall destroy thy strong cities, wherein thou trustest. 18 Nevertheless in those days, saith the Lord, I will not bring you to utter destruction. 19 And if you shall say: why hath the Lord our God done all these things to us? thou shalt say to them: As you have forsaken me, and served a strange god in your own land, so shall you serve strangers in a land that is not your own. 20 Declare ye this to the house of Jacob, and publish it in Juda, saying: 21 Hear, O foolish people, and without understanding: who have eyes, and see not: and ears, and hear not. 22 Will not you then fear me, saith the Lord: and will you not repent at my presence? I have set the sand a bound for the sea, an everlasting ordinance, which it shall not pass over: and the waves thereof shall toss themselves, and shall not prevail: they shall swell, and shall not pass over it. 23 But the heart of this people is become hard of belief and provoking, they are revolted and gone away. 24 And they have not said in their heart: let us fear the Lord our God, who giveth us the early and the latter rain in due season: who preserveth for us the fullness of the yearly harvest. 25 Your iniquities have turned these things away, and your sins have withholden good things from you. 26 For among my people are found wicked men, that lie in wait as fowlers, setting snares and traps to catch men. 27 As a net is full of birds, so their houses are full of deceit: therefore are they become great and enriched. 28 They are grown gross and fat: and have most wickedly transgressed my words. They have not judged the cause of the widow, they have not managed the cause of the fatherless, they have not judged the judgement of the poor. 29 Shall I not visit for these things, saith the Lord? or shall not my soul take revenge on such a nation? 30 Astonishing and wonderful things have been done in the land. 31 The prophets prophesied falsehood, and the priests clapped their hands: and my people loved such things: what then shall be done in the end thereof? 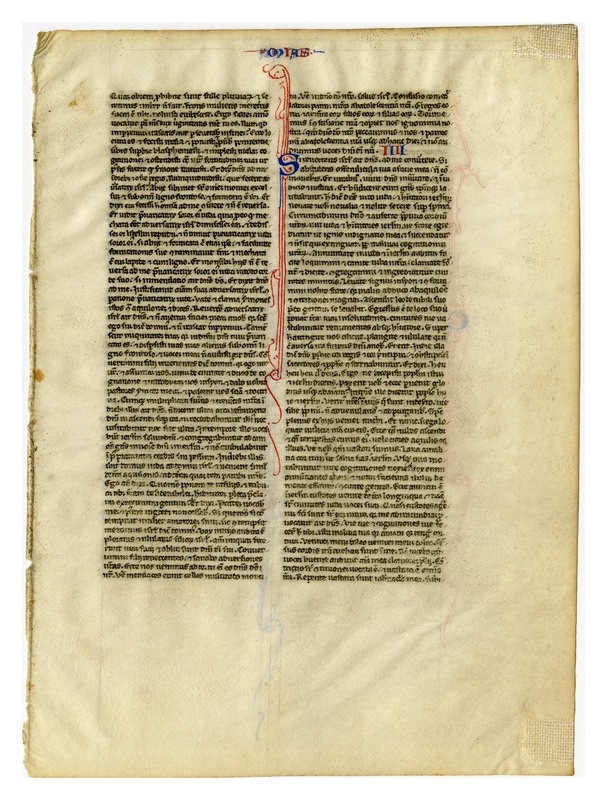 “E0009 Leaf from a Bible (Biblia Sacra Latina, Versio Vulgata),” Digital Exhibits | Denison University Archives & Special Collections, accessed April 23, 2019, http://exhibits.denisonarchives.org/items/show/33.